Have you ever wanted to interview a consulting specialist? We sure did – today we’re bringing to you transcripts of an interview with three of our specialist consultants, Elizabeth Blythe, Joe Strati, and Krupa Steffanoni. 1. Why do you love what you do? Elizabeth: I love to help people, and I love to learn. Each new client brings opportunities for both, and I’m always so proud of a job well done. Joe: I enjoy the variety of working in a team within different organisations to improve business outcomes and customer experiences. The teams form long-standing relationships and remain in contact well-beyond the end date of the project. Krupa: I love solving complex and interesting challenges. In the world of Business Transformation you get to see that happen in a tangible way. 2. What was your favourite project and why? Elizabeth: I led an end-to-end Digital Strategy rollout which changed the way the company engaged its customers and had a measurable, positive impact on my client’s bottom line. Joe: I led an activity across an entire organisation to satisfy changes in anti-money laundering and counter-terrorism financing legislation. I worked with a terrific group of people and the work resulted in compliance by all entities to the AML CTF Act. Krupa: Mine was a corporate entity simplification at a Wealth Management firm – a great mix of regulatory changes, system changes and people changes. 3. How is consulting different from other roles you’ve had? Elizabeth: Unlike other work I’ve done where the only brand I represented was my own, I’m now a representative of IQ Group. It has both another layer of responsibility, but also a sense of support, identity, and belonging. Joe: Consulting differs as it requires me to develop a deep understanding of a client’s organisation and their needs. I draw upon my knowledge and experience to provide an unbiased recommendation to help clients resolve problems or exploit opportunities. 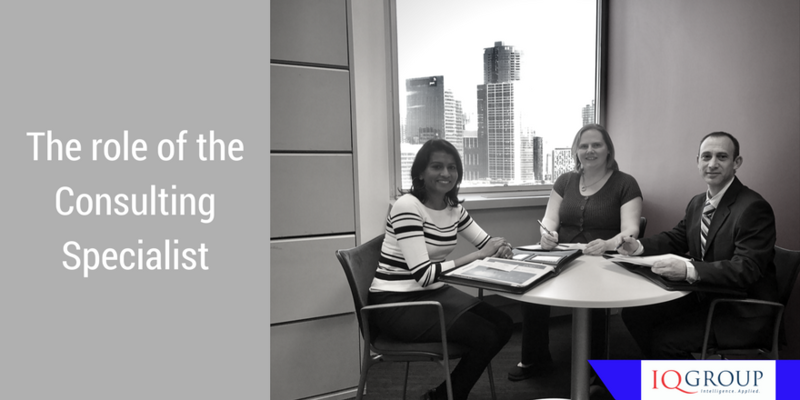 Krupa: As a consultant, I need to be able synthesise a lot of information about the client and their needs very quickly. Additionally, I need to understand culture and dynamics of the organisation and work out the most effective method for style of delivery. 4. How do you believe IQ Group makes a difference to clients? Elizabeth: IQ Group takes its responsibility to deliver to clients very seriously. We build partnerships and are responsible for ensuring client objectives are achieved, which is very different to, for example, hiring a PM through a recruitment agency. When I’m in the field, IQ Group as a whole supports our client and ensures the results I provide match their needs. Joe: IQ Group brings value to a client with our specialist knowledge and experience. We are focussed on working with clients within the superannuation and wealth management industry. We are actively involved in the largest industry bodies and have demonstrated time and time again that our team delivers. Krupa: IQ Group brings a unique blend of skills – superannuation industry experience along with technical and functional experience such as project management/change management together in a role to help clients achieve the best outcomes. 5. What trends do you believe will have the biggest impact on the Superannuation Industry? Elizabeth: The philosophical direction that regulation is taking. The government is currently defining the purpose of superannuation, which will change how regulations are made, and what their purpose can be. Regulation is always expensive for the industry, but hopefully this will reduce complexity and increase synergy around regulatory requirements. Joe: I believe that government initiatives to streamline super will have the greatest impact on the industry. Reducing the likelihood for multiple superannuation accounts, reduced administration for employers and automated reporting will impact both superannuation members, employers and funds. Krupa: Digital disruption is changing the way funds and its members interact. From a fund’s perspective, business analytics will drive new business and retention. Changing demographics of members will mean that in order to for a fund to engage them, an important part of marketing strategy will be to increase online and digital interactions. 6. If you could have dinner with anyone past or present, who would it be and why? Elizabeth: I’d go with Warren Buffet because I think I could learn a lot from him in a single sitting, both in terms of world view as well as a shared interest in Financial Markets. Joe:If I had to pick only one, it is the exceptionally talented Leonardo da Vinci. Da Vinci had a brilliant mind, and his ideas were centuries ahead of his time. I am fascinated to know what inventions he would imagine possible if he could utilise today’s resources and technology. Krupa: It will have to be Indra Nooyi who is the current CEO of PepsiCo. She is ranked in the World’s 100 most powerful women, and I would like to know what her recipe for success is.